Sample proposal letter for training program in school, college, academy, training institute. 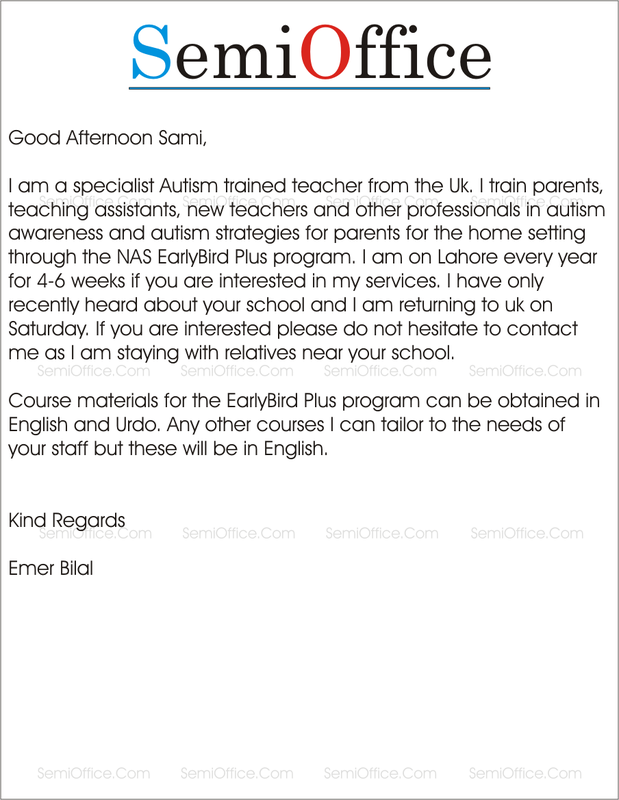 I am a specialist Autism trained teacher from the Uk. 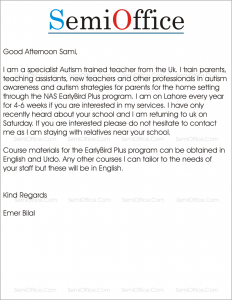 I train parents, teaching assistants, new teachers and other professionals in autism awareness and autism strategies for parents for the home setting through the NAS EarlyBird Plus program. I am on Lahore every year for 4-6 weeks if you are interested in my services. I have only recently heard about your school and I am returning to uk on Saturday. If you are interested please do not hesitate to contact me as I am staying with relatives near your school. Course materials for the EarlyBird Plus program can be obtained in English and Urdo. Any other courses I can tailor to the needs of your staff but these will be in English.